Making Room On The Shelves For These Six New Releases in 2015. After going through my lists I kept coming back to just these six. These six might end up on the favorites list if all the stars align. You know, when after reading the synopsis plus the anticipation and the right reading mood all create that glorious experience. Obviously I plan on reading more than only six new releases and backlist this year, but if I can get these babies under my belt, I’ll be a happy reader. There is only one book I’m most excited for and I am guessing is the same for many readers, Go Set A Watchman by Harper Lee. I’m planning a To Kill A Mockingbird reread before this book comes out on July 14th. And I plan to be that person at the bookstore waiting in a line to purchase my copy. And I plan to read it slowly and not rush to be the first person to put up a review. In fact, I’m reading no reviews for this one until after I read it. TKaM was a very special book for me as a young person and I’m not sullying the experience. Circling The Sun by Paula McLain is the historical fiction novel about Beryl Markham who was the other aviator and other woman Denys Finch Hatton spent time with while away from Karen Blixen. I loved Out of Africa and sooo excited to return to that time in history in Kenya. It’s out on July 28th. This was an unexpected addition to my list but I just couldn’t stop it from joining. “Each chapter in J. Ryan Stradal’s startlingly original debut tells the story of a single dish and character, at once capturing the zeitgeist of the Midwest, the rise of foodie culture, and delving into the ways food creates community and a sense of identity.” Kitchens of the Great Midwest releases on July 28th. Ok, there is a second book I’m most excited for. Shirley Jackson. Shirley freaking Jackson! She is the reason I fell in love with short stories. When I read “The Lottery” back in high school I was completely blown away by the story. It was horrific and I’m not into horror but loved it so. Some short stories are forgettable but I can remember the entire thing and how I felt while reading it. Let Me Tell You (Aug. 4) are a collection of unpublished stories, essays, letters and lectures put together by her children after siphoning through all her papers from the Library of Congress. Another visit to the bookstore for this one, no doubt. I am beyond excited and once again reading zero reviews beforehand. Lastly, City on Fire by Garth Risk Hallberg is a surprising addition to this list for me. Why? It’s not the length (944 pages) or the publishing war hype (a $2 million dollar advance?! That’s like $2,000 a page!). It’s not that it’s a first novel for a guy who is only 34 (but it is impressive) or that the few blurbs I’ve allowed myself to read has me intrigued. Forget it. It’s all intriguing. And I was sucked right in! I was denied my digital ARC so I guess I will be lugging it around come October 13th. Better get on the hold list now at the library. What new books are you anticipating for the rest of 2015? Tags: 2015 new releases, Garth Risk Hallberg, Harper Lee, J. Ryan Stradal, Lauren Groff, Patricia McLain, Shirley Jackson, top ten tuesday. Bookmark the permalink. I think City on Fire is going to big, really big. I just hope it lives up to the hype! Ha – I was denied the digital ARC of City on Fire as well! I have a hard copy from BEA, but I’m wondering if I’ll ever get through it that way and maybe I should just wait for the e copy when it’s released. I have peeked at the Prologue and part of Chapter 1 and it sucked me right in! 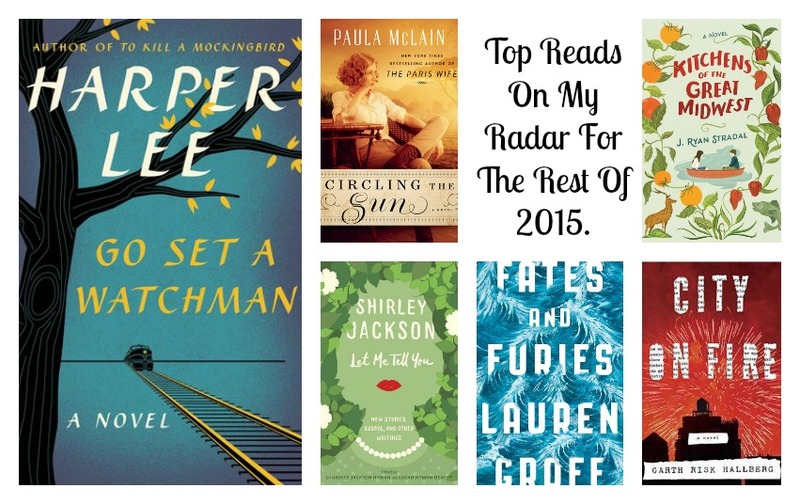 I’m also looking forward to Fates & Furies, Go Set A Watchman, and Circling the Sun. At least you got the print version, so that’s great! Hahahaha, I did the exact same math on my post today for City of Fire 🙂 And I’m silly, and somehow managed to leave Go Set a Watchman off my list… grave over sight on my part. Sadly, I have yet to enjoy Shirley Jackson, but recently found The Lottery and other stories at a used bookstore, so it’ll happen hopefully soon. Great list! Great minds…I’m kind of a Math nerd like that though. Great list too! I am glad you’re going to pound the pavement to get an early copy of Watchman, because I will be very curious to hear your thoughts. I’m struggling with whether I even want to delve into this one, for several reasons. Looking forward to what you think. I’ve heard so much about Shirley Jackson and other than The Lottery 1,000 years ago have not read any of her work, though I came *thisclose* to buying the audio of the haunted house one (aren’t I horrible, can’t even remember the title) when it was the daily deal. Where would you recommend one begin with her work? I know your struggle with Watchman. I felt the exact same when I heard about it’s release and if Lee really wanted it released. But now that it’s inevitable, I would like to see Scout as an adult and how that story influenced TKaM. So, we’ll see. As far as Jackson, I started with her short stories so a collection could work for you. I also read The Haunting of Hill House and We Have Always Lived in the Castle years ago and should do a reread. It’s funny because I identify myself as not into horror but her stories work for me somehow! It’s the publication part, and just simply the feeling that I’m not sure I want anything else influencing how I feel about TKAM. Silly, perhaps, so I’m really anxious to hear what you think of it. Thanks for the $.02 on Shirley Jackon’s work, I know so many people rave about her, I really need to pick one up. I picked up City on Fire at BEA and it will be interesting to see if the book lives up to the money they are paying the author. Kitchens of the Great Midwest is really appealing to me (and my stomach)! I’m so excited for Circling the Sun, Fates and Furies, and City on Fire! I’m a little bit afraid of the industry hype around City on Fire, but everyone I’ve heard has started it has said really good things. Yes, the old industry hype, but still want to check it out. So many great books ahead! You’ve got me curious about City on Fire. I am not sure I had heard of it before you mentioned it, but upon looking it up . . . Hmm. I confess I am not too excited about the Harper Lee book. I know I should be, but I’m not. A part of me really wants to read Paula McClain’s new book, but I didn’t even finish the last one so I’m feeling a little gun shy. I know there are a lot of mixed feelings about the Lee book and I haven’t read anything by McLain so we’ll see. Oh wow. I’ve seen the hype for Go Set a Watchman (seeing as how I haven’t read TKAM but that’s another issue entirely) but do you suspect there to be a lineup for the book’s release O_O? That’s intense! Thanks! I like Jennifer E. Smith too (on your TTT) and your blog is so pretty. The owl is the cutest! Ha! I just did a library display this week all in blue. It’s gorgeous and the books have been flying off the shelves. I guess we aren’t alone in blue cover beauty. I will drop everything when I get my hands on Go Set a Watchman! Another Jackson fan! I ended up reserving three of her books to do a little reread before the release. I haven’t even read To Kill a Mockingbird yet, but I”m sure I would like to get the new book too. It was such a huge book for me as a teen and I wonder how I will feel to revisit it some 25 years later!